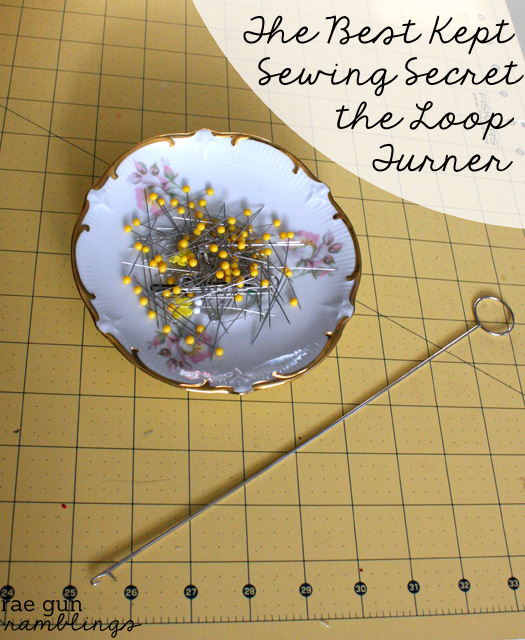 Do you use a loop turner? I have to admit that I rarely do but I’ll bet it would make my life a whole lot easier! Please welcome Marissa from Rae Gun Ramblings sharing her favorite tool in the work-room. Hi everyone! 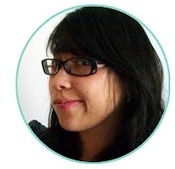 I’m Marissa from Rae Gun Ramblings and I’m so excited to be involved in this fun series. I blog about all things crafty, delicious, and bookish. For my day job I run an Etsy shop where I sell handmade baby clothes and fun stuff for YA readers so I sew all day long and I LOVE it! I’m thrilled to be sharing my favorite sewing tool because this is something that I found after I had been sewing for years and I have learned not a lot of people know about it. Are you ready? 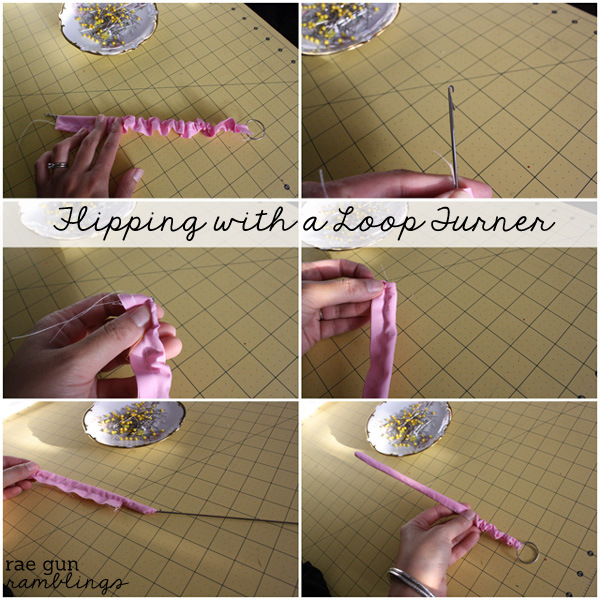 It’s a loop turner, and it’s Ah-mazing. It’s a thin metal stick with a hook on the end that you can use in a bunch of different ways. I’m going to share a few of the ways I use this tool All.The.Time. I use it to flip things. It’s so much easy than using a safety-pin to turn things right side out. I know some people that use it only for think spaghetti straps but I use this for straps of all sizes and I’ve even used it to turn vests. Basically you stick it in, hook it through a part of the fabric, massage it over the hook part and then pull the stick out while the hook pulls the part of the fabric you want flipped. I’m not going to lie this took takes some getting used to and there definitely is a learning curve. It can be VERY frustrating at first but once you figure it out it makes these kind of tasks SO much easier. I used this method on my Stool Pouch tutorial, lots of dress straps like this Castle Dress, as well as my Personalized Pencil Case tutorial. Another way I love using this is to pull elastic or ribbon through a casing. As long as the casing is really long or flat you can do this. 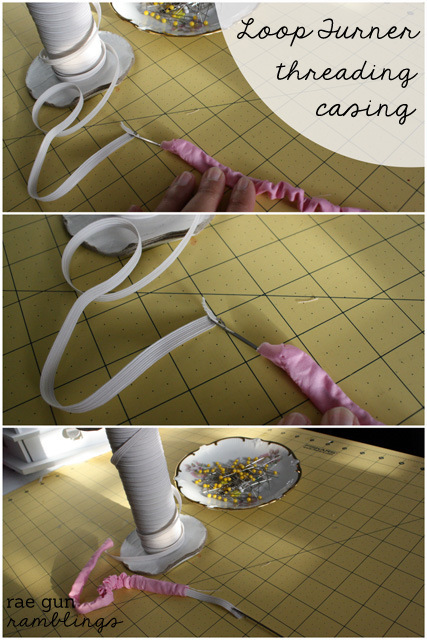 To do that you insert the stick into the casing hook your piece of elastic/ribbon and pull. I used this a lot when I am putting elastic into princess sleeves for the princess dresses that I make for my nieces. I also use it to pull the ribbon through the casing for these City of Bones Pouches and my little niece’s Mermaid Costume. I absolutely adore the look turner it has made my life so much easier. 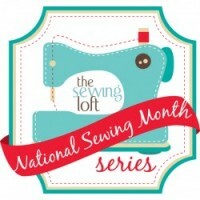 It’s inexpensive and you can find it at most sewing store on the notions wall. I hope you check it out and love it as much as I do. And be sure to stop by Rae Gun Ramblings to say hi sometime. Stay tuned, Tori from Totally Stitchin’ is sharing something fun tomorrow. Isn’t it awsome when you have the “right tool” for the job. Like anything, we have to learn to use the tool first. I have a bodkin for pulling elastic through a casing, but I use the “other end” where there is a smooth ball for nudging corners on something I have turned (like corners points on a pillow.). I use a bodkin too. I would be lost without it. I’m thinking of getting a spare (just in case). I didn’t even know something like that exists! I’m definitely going to have to get one of those. Thank you!!! I bought one a few years ago when my daughter and I were making and selling purses, turning straps by the 100s, it’s a good thing! It was so great to have you join us Marissa! I love seeing the loop turner in action! I went and bought one that same day and have used it at least 5 times since….awesome!